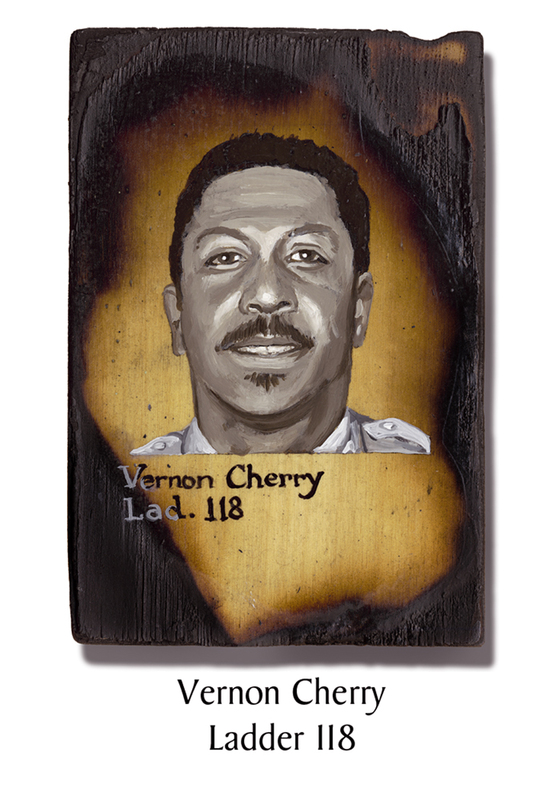 Vernon Cherry would have turned 50 that October. After 28 years as a firefighter, and 19 with Ladder 118, he had been planning to retire at end of 2001. Famous throughout the FDNY for his voice, his wife said “you always heard Vernon before you saw him.” Vernon sang all the time: at weddings, in the shower, at the Apollo, when cooking his famous mushroom-laden lasagna at the firehouse, at official FDNY ceremonies. His was the voice that sang the National Anthem for the Fire Department’s official 9/11 Memorial at Madison Square Garden, albeit that final time on tape and not live. He “always wanted to play the Garden” said his wife. Vernon and his wife fell in love at first sight and were married 31 years. They had 3 grown kids. Nicknamed “Mo” and sometimes “Cowboy” around the firehouse, Cherry was also a part-time stenographer at Small Claims Court and would sometimes sit at the firehouse’s kitchen table to transcribe his work. Cherry is buried next to Agnello and Vega at Brooklyn’s Green-Wood Cemetery. This entry was posted in Better Angels Stories and tagged 343, 9/11, better angels, Dawn Siebel, FDNY, firefighter, firefighters, firefighters of 9/11, Ladder Co. 118, LODD, Manhattan, memorial, NFFF, paintings, portraits, Vernon Cherry, World Trade Center, WTC. Bookmark the permalink.